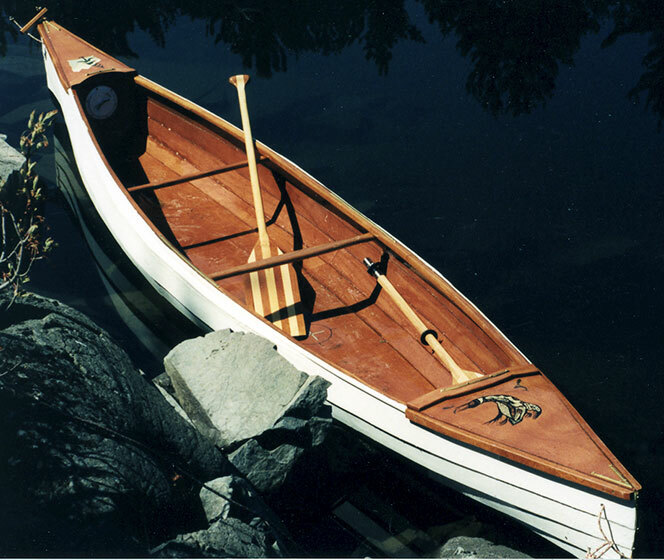 At just 39 pounds, this canoe is designed for easy portages in Derek Coleman's home waters of Killarney Park, Ontario. Derek designed an asymmetric hull with an adjustable, removable seat and nicely decorated bow stern decks. The lapstrake hull is constructed of marine mahogany, epoxied with fiberglass cloth. In designing the seat for flexability, Derek can paddle the canoe with a single or double paddle, while either kneeling or seated. Derek's email is dcoleman@agesplan.com.